So, this is one of those “recipes” that doesn’t take a lot to make. It’s quick, it’s simple, and it’s delicious. And, a great meal to start the day. I’m sort of hit or miss when it comes to breakfast, but J is really good about eating it every day. During the week he usually eats cereal and I try to make breakfast (bacon and eggs, sausage and eggs, quiche, etc.) on the weekends for him, but I knew that his weekday cereal routine was getting old and I tried to think of what I could do to give him another option. First I made a batch of sausage, egg, and cheese breakfast sandwiches and froze them, so he could take one out and heat it up if he didn’t want cereal. Then, after those were gone, he asked if the next batch could be with Canadian bacon. Why, of course it can! And let me just tell you…these are quick enough to make that I can make it before I leave for work in the morning and there is no freezing or reheating necessary. So, before he leaves for work he gets a nice, hot breakfast sammich that will tide him over just a little longer than a bowl of raisin bran or granola will. I think it takes a total of 5 minutes, if not less to make this. How much easier could a hot breakfast be?? Cook the egg, warm the meat, toast the muffins and throw it all together. ba-da-bing, ba-da-boom. Serve it with a side of fresh fruit and you’ve got one healthy breakfast! Crack the eggs in the skillet and sprinkle with salt and pepper. Use a spatula to break the yolk and cook until mostly white (not runny or translucent), about 2 minutes, then flip and cook an additional minute. Meanwhile, toast your English muffins and set on a plate. When the eggs are done, place one egg on the bottom bun of each muffin then top with a slice of cheese. Place the Canadian Bacon in the pan and heat about 30 seconds per side. Remove from the skillet and place two slices on top of each egg, and then the top bun of the muffin. Voila! Breakfast perfection. Serve with your favorite fresh fruit or wrapped in a napkin if you’re running out the door to get to work! 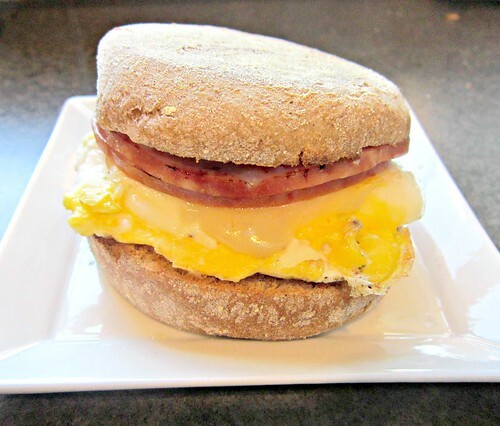 It is a nice blog in which you told that how to prepare Canadian Bacon, Egg, and Cheese breakfast Sammich which do not take much time to be cooked.